The event will be held from 8:00 a.m. – 6:00 p.m. in the Paul Gerry Field House at the Sullivan County Community College in Loch Sheldrake, NY. Sponsored by China City of America, Thompson Education Center, The Spencer Daniel’s Agency, Schmidt’s Wholesale, Superior Building Supplies, M & M Auto Group, WVOS/WSUL and Thunder 102. There will be retail, membership and food vendors, demonstrations, raffles and a petting zoo. 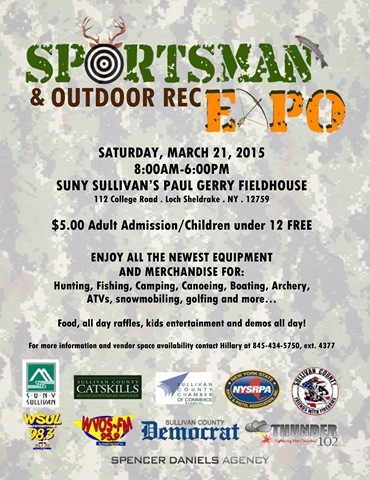 Vendors include hunting, fishing, canoeing, boating, golfing, trucks, equipment, archery, ATVs and more. Kids activities are available, and there will be plenty of gift ideas for the sportsman or sportswoman in your life. Admission is $5 and children under 12 are free. For more information, contact The Sullivan County Chamber of Commerce at 845-791-4200 or email chamber@catskills.com or the Sullivan County Visitors Association at 845-747-4449 or email info@scva.net.